Why Start a School Garden? From growing purple carrots to pretzel beans, school gardens can provide an engaging space for limitless learning opportunities. With youth becoming increasingly disconnected from the natural and cultivated world, it is more important than ever to create gardens as outdoor laboratories. These gardens connect students to plants, soils, ecology, and a multitude of other concepts in a hands-on, experiential learning environment. School gardens help children discover where their food comes from and form the foundation for making healthier food choices. Gardens can nurture life skills in youth, including responsibility, problem solving, and critical thinking. Gardens engage students by providing dynamic environments in which to observe, discover, experiment, nurture, and learn. Living laboratories where lessons are drawn from real-life experiences rather than textbook examples, gardens draw students in as active participants in the learning process. Science, math, language arts, health, and many other subjects can be introduced through hands-on experiential activities. School gardens can focus on fruit and vegetable production, building wildlife habitats, creating spaces for pollinators, or emphasizing countless themes from ABC gardens to storybook gardens. This publication will delve into the details of creating an edible garden. The idea for a school garden can sprout from anywhere: a teacher, a parent volunteer, a student, the principal, the groundskeeper, or the Parent Teacher Association (PTA) landscaping committee. Wherever it begins, all of those described above should be included from the beginning when discussing a potential garden. These stakeholders will be the leaders of the garden team. Consider including other interested parties and organizations that provide diverse experience and talents, for example, community members and neighbors, Cooperative Extension, farmers, and parks and recreation or nature educators. What are the goals or mission for the garden, and is a garden the best way to achieve them? Do we have administration support? If not, how will we obtain this? What are the different functions of the committee? Building community support is essential to long-term garden sustainability. This can include a variety of individuals who can be members of the initial planning team and provide expertise and offer valuable strategies for success. They can provide garden resources and educational curricula that teachers, parents, and volunteers can use with children in the garden setting. Their familiarity with the local community can provide connections to a network of local community members who can help build partnerships and assist in obtaining gardening resources. Sustainability is an on-going process that requires tending much like a garden. The individuals who may help launch a garden may not be the same group that maintains it over time. Crafting the structure of a garden team allows individuals to come and go, with new members providing continued support. While it is tempting to take a shovel and start digging in immediately, time spent planning saves on frustration, time, and money during the installation and results in a more sustainable project. Visit other school gardens in the area, and talk to the leaders to find out what worked for them, mistakes they made, and suggestions they might have. Take the time to engage with the school community, including teachers, students, parents, and the neighbors who would like to use the garden. TIP: School administrators and other garden visitors may need help making the connection between gardening and multidisciplinary learning. Learn to communicate the benefits in terms that resonate with them. Invite community leaders to visit the garden when it is alive with children learning. Offer them a tool and encourage them to get involved. The school garden design should reflect a thoughtful planning process whereby the garden team has agreed upon a set of goals and objectives that guide the design decisions. The design process is the perfect opportunity to engage the wider school community stakeholders to address ideas or concerns about the project. The garden team should think about why the school wants to start a garden, how and by whom it will be used, and the ways in which the garden connects with curriculum and meets community needs. Priorities can include science curriculum, food production, nutrition, waste reduction, and learning where food comes from. Reaching consensus on the purpose of the garden and the learning outcomes allows everyone to move forward together with a clear understanding about why some opportunities are pursued and others are not. The garden is an ideal setting to explore the scientific method with children. Be sure to solicit the input and participation of school maintenance professionals, and ask them to review the design to identify any potential maintenance challenges. They may also be able to assist with obtaining mulch, compost, and plants for the project. To create garden ownership, meaning, and relevance for the students, include them in the planning process from the start. Think about ways to gather their ideas of what the garden could be. An open-ended visioning process, using student drawings and magazine pictures and looking through books, can empower them in the design process. School gardens are most likely to thrive when the entire school community feels a sense of ownership in the planning process. The following suggestions are a few strategies for gathering ideas and building agreement between students, teachers, parents, administrators, neighbors, and other community members on the purpose of the garden, plants and elements to include, and ways the garden will be utilized. 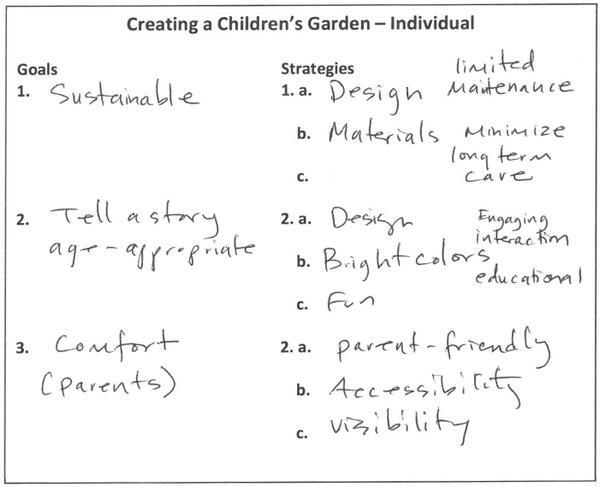 Bring together a group of stakeholders (students, teachers, parents, and others) and have participants identify priorities for the garden. Each individual writes three goals and three strategies to achieve each goal. Have individuals gather in groups of three to five people, share their goals and strategies, and select three goals and strategies for the group to present to the whole audience. After capturing all of the ideas, use facilitation techniques to develop consensus (Figure 1). 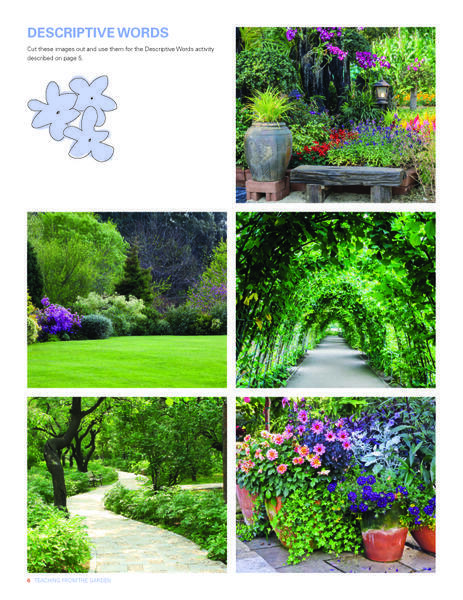 Individually show each participant a deliberately chosen set of images of gardens and garden features. Compile a list of positive descriptive adjectives and a matched set of negative adjectives. 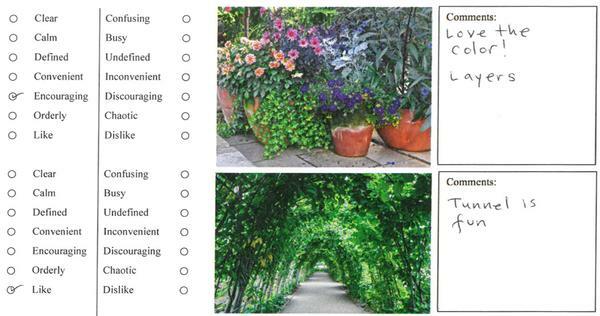 For each image, ask participants to select one word from matched adjectives (either positive or negative) that best reflects their reaction to the image. Compile reactions and present to participants. Ask participants to select their favorite image and share their reaction to the descriptive word with the group (Figure 2) (Sanoff, 2001). Based on the ideas of Henry Sanoff with NC State University’s College of Design, a wish poem helps identify needs and special concerns. Participants choose carefully preselected images and elements that show a variety of styles and forms they would like to see in the garden. They then give descriptions of how they envision their dream garden. 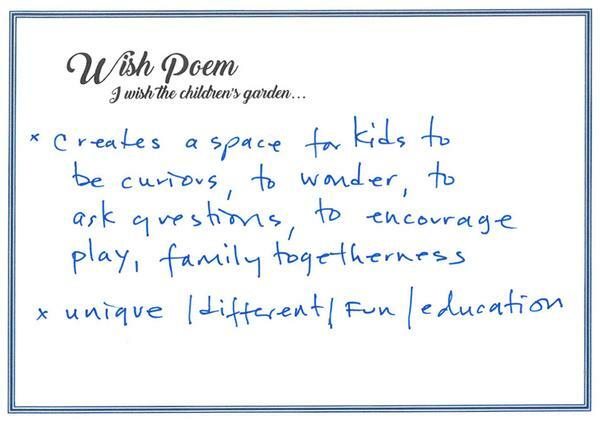 Participants then share their favorite points from their wish poem with the larger group (Figure 3). Figure 1. Developing goals and strategies. Set of images for use in descriptive word activity. From a courtyard bursting with blooms to a bounty of spring salad greens, there are many forms a school garden can take. Determine what kind of garden will be developed at the school, and sketch out a plan for the entire area, including all the components to form a master plan that can be built at once or in stages over time. Raised beds are a common solution for the prevalence of poor soil at many schools. Raised beds are constructed and filled with a blend of compost and topsoil. Raised beds can be built from lumber (pine, cypress) or plastic timber. The choice is often dictated by what is available for free or at a minimal cost. Raised beds can be expensive, and you may want to consider other planting options in the beginning, such as starting seeds inside the classroom or using outdoor planters. Raised beds should be no more than 4 feet wide so that children can reach into the middle of the bed without stepping in it. For younger students, beds that are 3 feet wide may be more appropriate. Beds can be any length, but at most schools where space is limited they are generally 4–6 feet long. Garden beds needn’t be boxy. They can follow the contour of the landscape or come in any shape or size depending on the space available. However, consider the maintenance challenges of mowing around a star shaped bed prior to installing one. Consider growing a “pizza garden” in the shape of a pizza pie! In this type of garden, the perimeter is a circle. Section the circle into “slices,” and grow pizza ingredients in each slice. For example, plant one slice with wheat, representing the pizza dough. Other slices could be planted with peppers, garlic, onions, and tomatoes. Finding the best site for the garden can be challenging as plant soil and light needs must be met. On many school campuses, topsoil is a scarce resource, and most of the open, sunny ground is occupied by playfields. Courtyards and open sections between buildings are often the only sites to construct raised beds, but they may receive sunlight for only a small portion of the day. If any grading took place to level the ground when school construction began, the topsoil was likely removed, leaving the poor subsoil. Sometimes the only choice is to transform perennial plantings or “landscaped” areas into a space that is more engaging for learning. By involving students in selecting a suitable site, curricular topics like plant and habitat needs can be explored. Start small! Nothing nurtures confidence like success and nothing fizzles enthusiasm faster than an overly ambitious site full of weeds. Begin with only as much as you can do joyfully, even if some of your volunteers quit or there are other unanticipated challenges. Begin by removing unwanted vegetation. Before breaking ground, call NC One Call at 811 to have the location of underground utility lines marked. Call the school district to have the location of private utility lines and easements marked. Once you have selected the potential site, have the soil tested before moving forward. April through November, soil can be tested for free through the NC Department of Agriculture & Consumer Services. The rest of the year there is a minimal fee. Soil testing boxes can be obtained through the local Cooperative Extension center, and agriculture agents can help interpret the results and make recommendations for nutrient application and pH modifications. Many soils in North Carolina are acidic and need an alkaline modifier, usually lime. Review the Extension publication, Minimizing Risks of Soil Contaminants in Urban Gardens, to determine whether you should also have soil from the site tested for heavy metals through a private soil testing lab. It is likely the soil has been compacted, so before constructing the beds, loosen the soil by ripping and tilling. Find a volunteer with a tractor or rototiller, because spading hard ground is likely to be difficult. You might consider planting a nitrogen fixing cover crop for a year or two to build soil structure prior to breaking ground. A multitude of plants should be considered for growing. Flowers and vegetables can easily be grown in the spring and fall, and if a school is on a year-round calendar, many warm season crops can thrive. You might begin by choosing vegetables that are easy to grow, mature quickly, and can be eaten raw, such as radishes or leaf lettuces. Snacking on vegetables that the children grew themselves makes the experience meaningful and real. Fruits such as strawberries, blueberries, and figs are easy to grow and offer a delightful treat. Other plants such as cut flowers, ornamental perennials, shrubs, and trees offer a variety of opportunities for students to investigate throughout the seasons. There are supplies, tools, and equipment that will be needed to grow a garden, and there must be some means available to water the plants. Ensure that there is a potable water supply that is easily accessible. A school might consider installing a cistern to harvest rainwater for use on ornamental plantings. Reference the Extension publication, Water Quality of Rooftop Runoff: Implications for Residential Water Harvesting Systems for suggestions to optimize cistern use. Hoses and sprinklers are necessary to bring water to the garden space. Large buckets are a great tool to engage young gardeners. Students can fill them with water and dunk watering cans into them for use in irrigating the crops. Shovels, hoes, rakes, and hand trowels will be necessary. Seeds and plants are necessary to grow a crop. Fences can keep out rabbits, deer, stray dogs, and other unwanted visitors. Some gardens have a locked gate on the fence to also keep out unwelcome people. Other gardens are fenced, but leave the gate unlocked to welcome all. Some gardeners have found that the higher and stronger you build the fence, the more attractive it is for vandals to enter and cause destruction. Others have found that welcoming the community into the garden, with positive rules that promote clear expectations, serve to extend the sense of ownership, thereby protecting the garden. This may also increase awareness of and comfort with the garden, which may aid in the recruitment of new volunteers. The educational activities that take place in the school garden will require supplies, too. With classroom budgets pinched, donations become the normal means of acquisition. The school garden team, including 4-H Extension programs, may be a fertile ground for gathering what is needed to make a gardening educational activity succeed. Growing edible produce from seeds and plants may take as little as 30 to as many as 120 days. Planning for educational activities and care of plants will vary according to what is being grown. Many school calendars lend themselves to fall, spring, and summer plantings. Coordinate with the school schedule to ensure there is time for planting and harvest. Soil preparation, planting, watering, weeding, and pest management can all be “lessons” in and of themselves, with many curricula and garden lesson plans available to make those lessons even more meaningful. These same resources provide an abundance of other educational activities that can occur to reinforce science, math, health, and other subject matter that is the standard course of study for the grade levels involved in the project. School class sizes vary, depending on the school district. Actively engaging and involving 30 children all at once in a 4-foot by 12-foot garden space is a challenge. One management strategy is to encourage volunteers to help on garden days and be responsible for small groups of students. Students can rotate through different gardening activities, or a class might be split into groups, with one half remaining inside and the other in the garden. Follow best practices for child safety, including ensuring that volunteers have had background checks or always teach with the teacher present. Volunteers can make the learning process better. Properly trained in the planned curricula or in appropriate educational activities, volunteers can engage three or four sets of children from the classroom sequentially in a valuable educational experience. The volunteer may be Extension staff, a parent volunteer, a science lead teacher, an Extension Master Gardener volunteer, or someone else who likes to garden and enjoys teaching children. Volunteers will need training, and Extension can take the lead in this process. Train-the-trainer sessions can expose both teachers and volunteers to school gardening curricula that address a range of subject matter and give them the opportunity to try any educational activities themselves before engaging children in them. School gardens in North Carolina are perfect for growing spring and fall gardens. Planted in early spring, cool-season vegetables will mature before school ends for summer break. This way the vegetables may be harvested, and low maintenance cover crops can be planted for the summer. Cool-season vegetables can be planted again in late August/early September as school begins and will be ready to eat before Thanksgiving. Vegetables such as lettuce, spinach, chard, kale, turnips, radishes, collards, broccoli, onions, parsley, and dill grow wonderfully in cool weather. For more information, consult with your local horticulture/agriculture Extension agent for planting dates and recommendations. In addition, fruit like strawberries, figs, and blueberries can be planted and easily maintained. Harvesting vegetables that students have raised themselves, even some they’ve never tried before, and eating them in a fresh salad is a nutritional experience the children will not forget. Consistent garden maintenance practices such as weeding, watering, harvesting, mulching, and planting can be challenging. With most students following a traditional school calendar, there is considerable time when the school is out of session with limited staff and student resources to provide continuous cultivation. Traditional school calendars have summer vacation during the prime summer gardening season. This not only makes it difficult to grow and harvest some of the most popular summer vegetables such as watermelons and sweet corn, but it raises the question of who will maintain the vegetable gardens during that time. Summer vegetables planted just before the school year ends in May are likely to die or become overgrown with weeds before children return in the fall. Certainly, school administration, and most importantly the custodial staff, will not be pleased with a raised bed with weeds grown five feet tall. Year-round schools may be more flexible in what they may be able to grow and harvest but still have breaks that might be as long as six weeks. Volunteers may be needed to tend the garden during school breaks. In return for maintaining the garden, the volunteers can be rewarded with produce and still leave enough for harvest when students return. Volunteers may consist of teachers, community members, students (K–16) and their families, 4-H or FFA clubs, businesses, faith-based groups, and other community organizations. Locate the garden in a highly visible space. Increased visibility and traffic can minimize vandalism. Engaging as many children as possible in the project and giving the entire school ownership of the garden helps to limit chance vandalism. Many school gardens are organic to limit children’s exposure to any harmful materials that might otherwise be used in a vegetable garden. Include flowers in and around the garden to encourage beneficial insects that will eat or parasitize garden pests. Beneficial insects provide obvious ecological lessons. Ecological relationships of plants to plant pathogens can also be a part of the discussion of pest management. The issue of pest management introduces the concept of environmental stewardship to students. Consider engaging students in researching and implementing ways to manage pests in their gardens as a way to grow problem solving and critical thinking skills. Keeping the garden going over time requires commitment from all partners in the project. Gardens need at least weekly attention during the school year. of the energy needed to sustain the project. Providing ongoing training for teachers and volunteers and adequate garden resources should be a priority for ensuring the garden continues to serve its educational function. Rely on your garden team to continually recruit and manage volunteers for a strong, consistent cohort of people invested in the garden’s success. Create a strategy to fund your garden’s long-term development and maintenance with both financial and in-kind resources. How will the garden be funded? Who will manage the money? Where will donations be deposited? Do you have a fiscal agent with a 501(c)(3) so that all donations are tax deductible? How much will it cost? Create a budget. Schools can pursue youth garden grants given by local foundations, national nonprofit and for-profit organizations, or from government agencies. Local businesses may provide sponsorship in exchange for visibility of their businesses. Parent-teacher organizations may include an annual allocation for the school garden. Have a list of garden needs (materials, staffing, program supplies) available to give to potential donors when the opportunity arises. Send the list home with children; often parents are happy to donate old tools, leftover seeds, and more. For building projects, identify an experienced carpenter or builder in the group to organize workers. Identify those with plumbing, electrical, and irrigation knowledge and skills. Ask volunteers to bring needed tools including saws, hammers, posthole diggers, wheelbarrows, shovels, spades, pickaxes, digging bars, and spading forks. Parents who are not able to volunteer may be happy to purchase items for the garden. The list can also be distributed during school fundraisers; for example, create a “Giving Tree,” with individual needs written on separate colorful cards clipped to the tree. People can select the cards listing items they are willing to donate. Plant sales and silent auctions are additional fundraising options to sustain the garden over the long term. Resources, both time and money, used to develop content, coordinate the work of others, and deliver educational programming have costs associated with them. Being able to document the benefits associated with these costs and to demonstrate that benefits exceed costs provides accountability to the individuals, organizations, and public entities that provide resources. Demonstrating positive changes in knowledge, attitudes, skills, and aspirations in children is a means of measuring positive outcomes from the project. Other outcome measures include things that happen because of the project. For example, because a child was involved in the project, his or her family started a vegetable garden at home, and they now enjoy the benefits of a healthier diet. If this sort of outcome is observed, it can be reported as a success story. Success stories have powerful effects on attitudes of administrators, funding agencies, and others in a position to influence whether the project goes forward. TIP: Thank you notes, handwritten and delivered by children, with photos of fun learning in the garden are a powerful way to show appreciation. Volunteers are amazing assets that will add value to a school garden program. They can provide expertise, labor, materials, and connections, and they can ensure success. Volunteers who encourage children to take full advantage of their outdoor gardening experience will enrich your school gardening program. Children are naturally inquisitive, and volunteers who encourage children to think for themselves are invaluable. There are many places to recruit volunteers: 4-H clubs, Extension Master Gardeners, local garden clubs, the PTSA, retired teachers, neighbors, and other community resources. Not all volunteers may want to work with children directly. Those who want to help gather resources or support the development of infrastructure are tremendously valuable, too. Hold frequent orientation and training sessions for volunteers. They can quickly feel very lost if released into the school setting without knowing school rules and policies, knowing teachers and other school personnel, or knowing where to turn for help. Be available to answer their questions and help with problem solving. Keep a good record of volunteers with up-to-date contact information. Establish a standard method of communication that is delivered consistently, such as a LISTSERV. Create a written schedule of events that is communicated to volunteers. Provide constructive feedback to your volunteers. Recognize and reward your volunteers. Use social media to engage the community. School gardens enrich the lives of the children and adults who explore their spaces. A garden creates an accessible environment to investigate science, math, reading, writing, and history— bringing each of these subject areas to life. From understanding fractions in a pizza garden to writing rhymes about bugs or discovering how cotton makes a t-shirt, the garden is a context to experience these ideas hands-on and to contribute significantly to student success. Involve students in each step of the process whenever possible. A garden builds a community within a school and its surroundings, creating relationships and learning that last a lifetime. For a full list of curricular resources, visit North Carolina 4-H’s Grow For It program. Down-to-Earth assists the helper in using gardening as a means to explore plant growth and development. Through this hands-on, minds-on program, youth learn the basics of botany, the gist of gardening, the essentials of ecology, and much more. Through gardening, youth stimulate their senses and cultivate science processes and life skills. By gathering data via the scientific method, youth feel a sense of pride and responsibility. This award-winning 88-page activity guide is an excellent resource for school enrichment programs, organized 4-H clubs, school-age childcare educators, after-school programs, nature centers, summer youth camps, scouts, and traditional school settings. Developed by North Carolina A&T University. (144 pages). The 4-H Soil Solutions enrichment curriculum is developed for a third grade audience interested in learning about plants and soils in a fun, interactive way. Aligned to meet the North Carolina science standards in plants and soils, the lessons draw from current research and knowledge from NC State’s crop science, horticulture, and soil science departments. Includes eight lessons covering the following topics: soil properties, soil and water relationships, soil and plant growth, composting, seed germination, pollination and flowers, and plant growth and development. This resource is available for free through your local Cooperative Extension center. Contact your 4-H or agriculture/horticulture Extension agent for more information. Schoolyard strawberry gardens provide rich spaces for students and teachers to explore concepts relevant to their curricula in a hands-on, experiential way. A strawberry garden, modeled on the annual hill production system used by farmers in the southeastern United States, fits neatly into the traditional-year calendar for elementary schools, with students beginning school in late August and finishing the year in June. This coincides with the southeastern strawberry production system in which strawberry plants are set into the ground between late September through early October, and the fruit is harvested in late April to early May. This growing schedule enables students to observe the life cycle of the strawberry plant throughout the school year. Provides teachers with the resources to teach students about the wonderful world of gardening. There are eight chapters with hands-on, novel learning experiences for youth. The curriculum also includes activity pages, worksheets, JMG rhythms, reading passages formatted for standardized tests, and much more. After studying life skills and careers, students may culminate their learning experience with service activities. This JMG curriculum is designed for students in grades 3 to 5 and 6 to 8. Developed by the Life Lab Science Program, this award-winning second edition has been revised to meet current science standards. A wonderful collection of classic garden activities, The Growing Classroom is a teacher’s manual featuring step-by-step instructions and strategies for setting up a garden-based science program and outdoor classroom activities. Topics include planning a garden laboratory, facilitating investigative lessons on ecology and nutrition, and involving the community. Includes an expanded gardening resource section. Bucklen-Sporer, A. and Pringle, R.K. (2010). How to Grow a School Garden: A Complete Guide for Parents and Teachers. Portland, Oregon: Timber Press. Danks, S.G. (2010). Asphalt to Ecosystems: Design Ideas for Schoolyard Transformation. Oakland, CA: New Village Press. Guy, L., Cromell, C. and Bradley, L. (1996). Success with School Gardens. Arizona Master Gardener Press. Sanoff, H. (2001). A Visioning Processfor Designing Responsive Schools. Washington DC: National Clearinghouse for Educational Facilities. Waters, A. (2008). Edible Schoolyard: A Universal Idea. San Francisco: Chronicle Books. Special thanks to the vibrant school and youth gardening programs through Avery, Durham, Guilford and Harnett Extension for the use of their photos.